When Boram Shin’s bosses at the Sheraton Waikiki sent her to a special training session, it wasn’t exactly reassuring. Marriott International had just acquired Starwood Hotels & Resorts, which manages the Sheraton, and the training focused on how to use a new mobile check-in app. The fear for Shin is that one day she and her colleagues in Hawaii and elsewhere could be replaced by an app and a kiosk, just as grocery cashiers and airline ticket clerks are increasingly being replaced. It’s unlikely that front desk clerks will go the way of old-fashioned elevator operators, but the fear of the unknown has workers like Shin anxious. 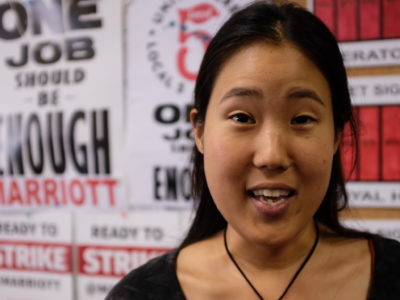 Boram Shin, a front desk clerk at the Sheraton Waikiki and member of Unite Here Local 5, has some anxiety about how automation will affect employment at local hotels. Shin is one of approximately 2,700 workers who have walked off the job at several of the state’s iconic hotels. Members of Unite Here Local 5, the hotel union, are on strike at the Royal Hawaiian, Westin Moana Surfrider, Sheraton Waikiki, Sheraton Princess Kaiulani and Sheraton Maui, which are owned by Kyo-Ya Hotels & Resorts and operate under various Marriott brands. Workers remain on the job at the Waikiki Beach Marriott, although they have voted to strike and could walk off at any time. Local 5’s contract expired in June, and about 50 items are at issue as the parties discuss a new one, union officials have said. One of the big issues involves automation. Paola Rodelas, a spokeswoman for Local 5, said the union doesn’t oppose technology, but it wants a place at the table as hotel management plans how to adopt labor-saving tools. The concerns come at a time when jobs once reserved for people are increasingly being replaced by machines and mobile phone apps. It’s no longer just factory workers being replaced by robots — or even cashiers and clerks. 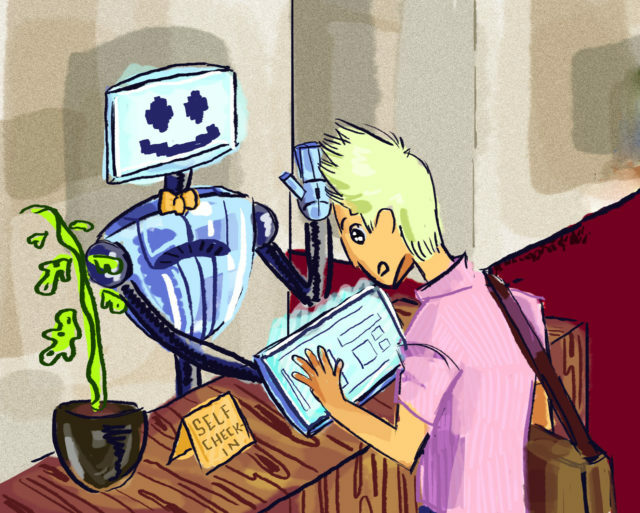 Robots already are staffing front desks at hotels and mixing fancy cocktails. The reality of driverless taxis is looming. And even the idea of fancy food made by machines — specifically 3D printers — is no longer the stuff of science fiction. While none of this has caused a mass displacement of jobs, worker advocates like Local 5 are worried. And with good reason. A 2016 report by the consulting firm McKinsey & Co. determined that hospitality jobs, which often involve routine physical tasks performed in controlled indoor environments, are especially vulnerable to being replaced by machines. Industry experts say increasing automation in the hotel industry is inevitable. “Since predictable physical activities figure prominently in sectors such as manufacturing, food service and accommodations, and retailing, these are the most susceptible to automation based on technical considerations alone,” the report said. Technology generally helps corporations do things faster, cheaper and better, says Cole. And that can serve both customers, who want “the best experience at the lowest price,” and hotel owners who want “maximum revenue at the lowest cost,” he said. Unfortunately for workers, this can mean needing just four people for tasks that it once took five to do. “Technology is generally hostile to human employment,” he said. Dara Young, a spokeswoman for Marriott, did not return calls for comment. One of the realities facing the industry is that travelers often don’t want to deal with a clerk for simple administrative tasks, like checking in or out, said John Russell, a hospitality industry consultant based in Destin, Florida. Russell said it’s too soon to adopt a motto like, “We are automatons serving disinterested boors,” but he said there are people who prefer interacting with faceless kiosks over real people. “You have to recognize that if a customer doesn’t want to deal with a live person, you have to offer that option,” he said. 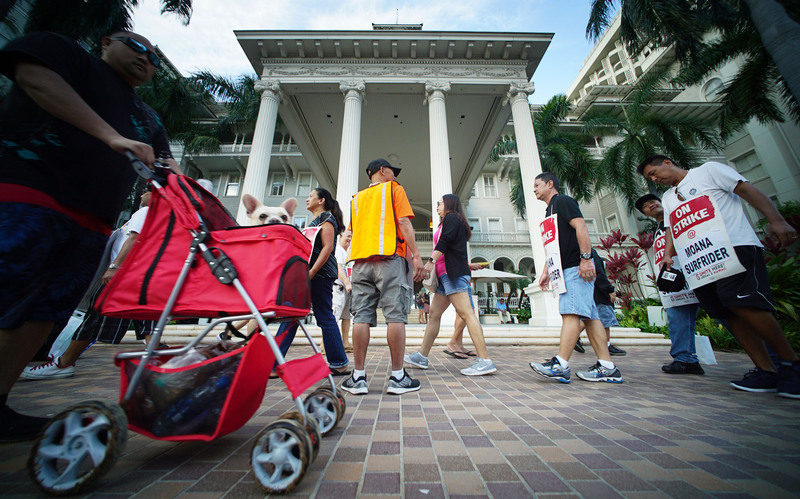 Marriott is rolling out mobile check-in at all of its former Starwood properties, which include the Moana Surfrider in Waikiki, where workers are on strike. To be sure, some more dramatic uses of automation in the hospitality business are novelties, like the dinosaur front desk clerks at Japan’s Henn-na Hotel or the bartending machines at the Tipsy Robot bar in Las Vegas’ Planet Hollywood Casino and Resort. Novelty definitely was part of the bar’s appeal, says Paula Yoo, a novelist and television writer and producer from Los Angeles who went to the Tipsy Robot during an annual trip to Las Vegas with her husband. Still, while the robots made good subjects for jokes about the “Terminator” movies, they were no substitute for human bartenders, Yoo said. And she said they were a sobering reminder of the damage robots did to auto worker jobs in Detroit, where Yoo once worked as a newspaper reporter. Losing lower-level hospitality jobs means losing jobs that are often stepping-stones for people just starting out, she said. Plus, replacing people with kiosks means an increasing lack of human interaction. “We’re at a tipping point, and it’s going to be interesting to see where we go now,” she said. The mobile check-in that Honolulu’s Shin trained for is being rolled out at all former Starwood hotels, Marriott reported. And the company said it had also greatly expanded its mobile key system, which allows guests to use their mobile phones to unlock their rooms. Marriott is also implementing a system that lets guests use their phones to order room-service meals, rather than having to call an operator. Such features could theoretically let guests stay at a hotel without ever talking to a front desk clerk, food staff or bellman, said Cole. An app also could do a lot of functions of a concierge, like offering restaurant recommendations, he said. Local 5 is asking the same types of questions. “It’s just a lot of question marks in terms of automation,” Shin said. Despite the trends, it seems unlikely that hotel workers will be replaced completely by apps and kiosks. Many customers still want personal service from a real person, said Cole. And management often is willing to provide it. As an example, Cole pointed to the Pierre Hotel in New York, where he once worked. The hotel kept live elevator operators on staff and had an old-school concierge who knew how to get tables at the most popular restaurants and snag front-row seats to sold-out Broadway shows. There will always be guests willing to pay for such services and hoteliers willing to provide it, he said. Finally, there’s the issue of a guest’s experience and the hotel’s ambience. The thought of a hotel lobby devoid of staff overseen by kiosks, androids and disembodied voices emanating from Alexa speakers is probably just too weird for most people, Russell said. Without people, a hotel has no personality, he said. “The personality of the hotel is the personality of the staff,” he said.